The chapel is closely linked to the town of Ciutadella, an emblematic place for the people there and for their patron saint festivities. 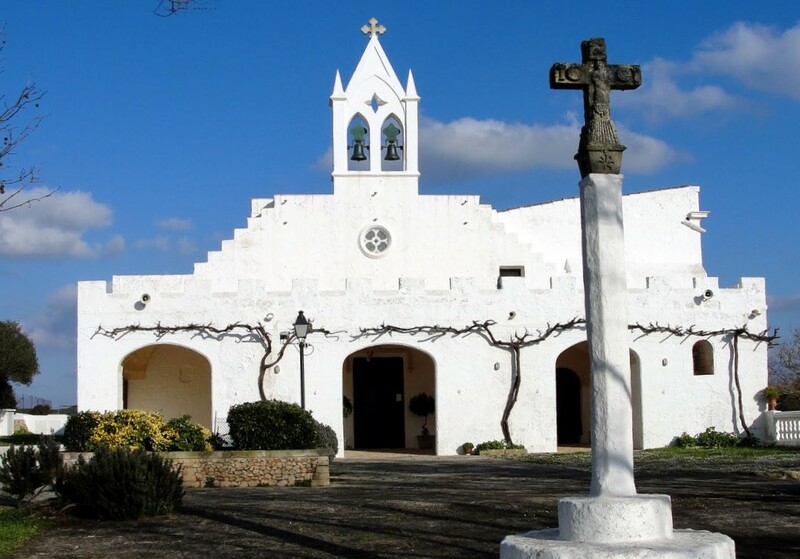 This small church is from 1301 it was founded by King Jaume II as one of the 7 churches that divided Menorca. It consists of a single floor of Gothic style, and two chapels, San Isidro dating from the seventeenth century and Our Lady of Providence of 1884. The rehabilitation of the chapel eliminated one of its main characteristics the whiteness of its walls, leaving in sight the current sea stones. Even so its main charm is its battlements and its bell tower, rare constructions in the architecture of the island that trim its white silhouette in the south of Ciutadella. The intention of the king was to establish in this area a new population, but this idea did not triumph, since throughout the 14th century it was transformed into a chapel and became dependent on the parish of Ciutadella. During the festivities of Sant Joan. The members of the old Brotherhood of Sant Joan, els Caixers, move on horseback, from Plaça del Born through Sant Joan Street, to the rural hermitage, for the complete ones. This is the origin of Caragol del Born of the Fiestas de Sant Joan.